My friend Shanna has been saying for a while that I’m very into beauty. I always denied it because I pretty much never wear makeup and I’m sort of a dunce when it comes to my hair (my daily styling product is just water), but finally had to admit that if skincare counts as “beauty,” she might be onto something. When I was on vacation over the summer and looked at all the tiny skincare products and mask samples stuffed into my toiletry bag and had to face the truth. So, fine! I will admit that I’m very into my skincare routine and keeping it up on the go. When I travel, I always make sure to bring all of my usual daily products (or at least ones I’ve used before and like) to use while I’m away from home. During my last international trip, though, I decided to step it up and do some skincare during the flight as well. Spending hours on a plane with dry recycled air is enough to make anyone feel like a raisin, but this routine kept me feeling a little more like a more like a grape instead. Plus it made me feel like I was at the spa for a few minutes instead of wedged into a tiny airplane seat. Before I start touching my face I want to wipe my hands clean of all the things I probably touched getting through airport security and being out in the world for many hours. It’s hard to tell these days how strict the TSA is being about liquids, but Wet Ones or Purell Wipes are a good bet if you’re already bumping up against your limit of liquids and gels. Plus, since they’re wipes, you can use them to wipe down the tray table or whatever else you think needs sanitizing. These wipes are one of my favorite products of all time. 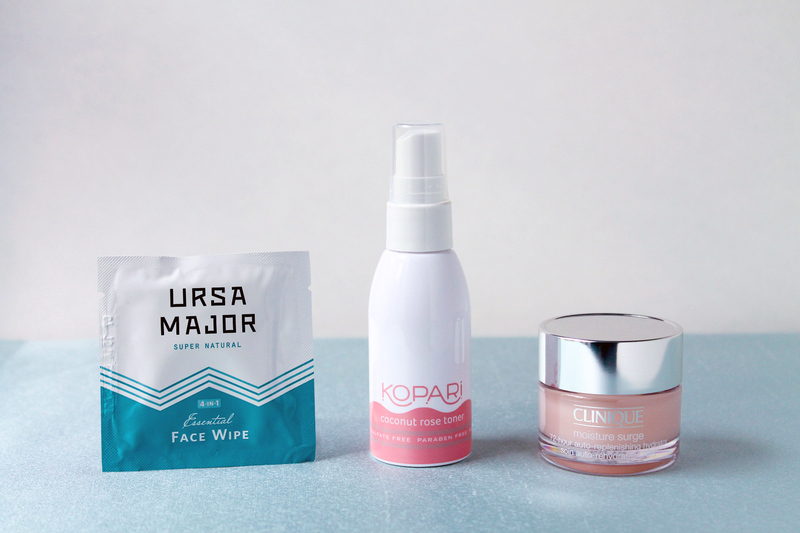 I’ve been using the Ursa Major Fantastic Face Wash for a few years and this is sort of like that, but on the go. I always keep some of these in my gym bag to do a quick cleanse post-workout. They come individually wrapped which makes them perfect for travel since you don’t have to carry a whole giant package of wipes. I use them in-flight to do a quick cleanse and wipe the airport grime off my face before I start putting on masks or moisturizer. Mainly I love this toner because spritzing my face makes me feel immediately like my skin is more hydrated. I don’t know if that’s exactly how that works, but it has a combination of witch hazel, rose extract, and coconut extract to fight bacteria, soothe, and hydrate. I got the travel-sized bottle as part of their Coconut Skincare Essentials Starter Kit. Full disclosure, I got this kit for free in a swag bag last year, but I’ve also paid real money to re-up most of the products after it ran out! I know some people love to mask on the plane, but sheet masks feel a bit more conspicuous that I might like and other masks seem too difficult to wash off from comfort of my seat. For that reason, I like to use this light but super hydrating moisturizer from Clinique. The nice thing about it is that it’s made for layering so you can use it to add a boost of hydration to your regular moisturizer and it won’t feel heavy. I usually use it before other moisturizers, but it can also be used after if you need more later in the flight. If, like me, you don’t want to draw a lot of attention to yourself with an elaborate mask, these eye gels might be a better option. They’re a nice compromise between looking like someone from a horror movie in a sheet mask and not masking at all. I stick these under my eyes and then and then lay back, relax, and enjoy the soothing cooling sensation. During this trip I also tried out Rodial Dragon’s Blood Eye Masks because I couldn’t find the Skyn Iceland version during my last minute shopping around SoHo. The sales person at the store recommended Rodial and claimed that a lot of celebs use them before they hit the red carpet, but they ended up being a bust for me. The gels were so thin that they kept folding over on themselves as I tried to put them on. Then the plane air was so dry that they dried out almost entirely and got super stuck to my face! The moral of the story is get the Skyn Iceland ones and don’t let someone in a boutique trick you into getting something else. Luckily I was able to buy the ones I like on the flight back! Sunscreen? On a plane! Yes! Unless it’s night time, there can be some pretty intense rays coming in through those plane windows. 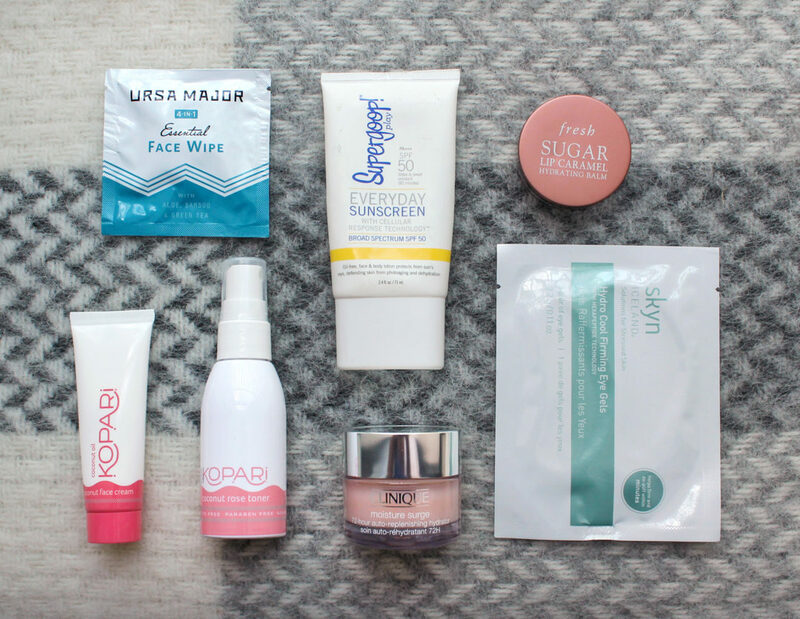 My favorite daily sunscreen is aptly called the Everyday Sunscreen from Supergoop. It rubs in easily, doesn’t clog my pores, and most importantly, doesn’t leave a white cast on my skin. My only (very obvious) caveat is don’t put this too close to your eyes. I say this, and yet it happens to me all the time. I rub my eyes later in the day and suddenly my eye is burning! Don’t do let that happen to you. If I happen to be on an overnight flight then I use this instead of the sunscreen (because obviously the SPF wouldn’t do me that much good in the dead of night). It’s not necessarily my favorite face cream of all time, but it conveniently comes in the kit with the toner. It smells nice, doesn’t clog my pores, and works well with the Clinique moisturizer I already put on. I have a few lip balms in rotation so which one I use kind of depends on my mood. 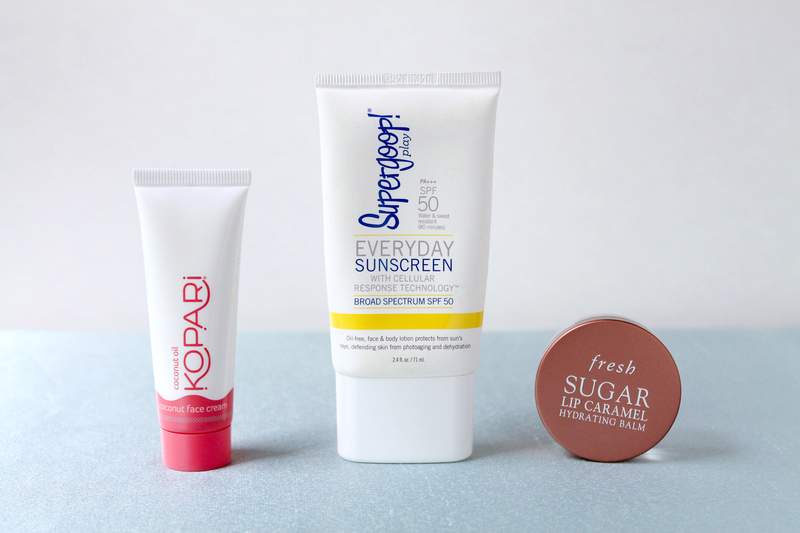 One of my top picks is Fresh Sugar Lip Caramel Hydrating Balm. I have long been a fan of their line, but the Lip Caramel balm is by far my favorite. It keeps my lips moisturized for hours and smells delicious! I also love the NUXE Rêve de Miel Ultra-nourishing Lip Balm, which I bought at Christina’s recommendation when I went to Paris. If you’re already feeling tired from all of this and just want something easy the Kopari Coconut Lip Glossy that comes in the kit is a solid choice. I use it all the time! That’s pretty much it! Of course drinking a lot of water in the day or two before the flight is a good idea. Drinking a ton of water during the flight is less ideal because then you’ll be making a few visits to the lavatory. Having written all of this, I’m definitely feeling extra and imagining Shanna laughing at the idea that I didn’t think I was that into beauty. But if you decide to give this a try, let me know how it goes! I want to know who else is out there doing a full facial on an airplane.